Thank you for your interest in employment opportunities with CP Nel Museum. Due to unforeseen circumstances, a hiring freeze has been imposed on filling up position. 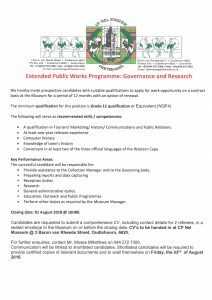 The vacancy for the EPWP: Governance and Research will not be filled at this time. We appreciate your interest with us, and we wish you success in your job search and we will consider your CV once the position is advertised again.